Here’s an interesting handbill. 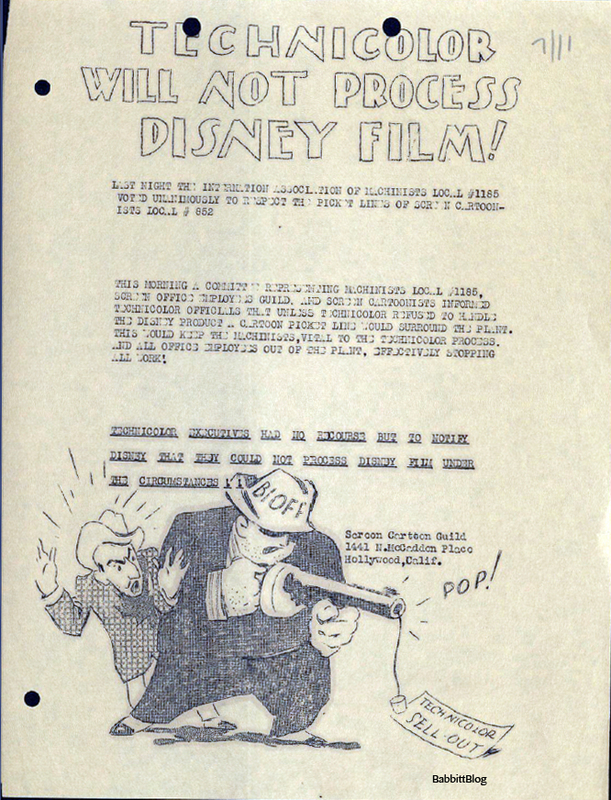 Dated July 11 (1941), it advertises the support of the color film processors’ union for the Disney strikers. Caricatured below is Walt, hiding behind Willie Bioff. The company hired Bioff to represent the company during arbitration (i.e. settling the thing once and for all). However, Bioff was a racketeer, a blackmailer, and had ties with the mob… but more on him later. Last night the internation[al] association of machinists local #1185 voted unanimously to respect the picket lines of screen cartoonists local #852. This morning a committee representing machinists local #1185, screen office employees guild and screen cartoonists informed Technicolor officials that unless Technicolor refused to handle the Disney product, a cartoon picket line would surround the plant. This would keep the machinists, vital to the Technicolor process, and all office employees out of the plant, effectively stopping all work! Technicolor executives had no recourse but to notify Disney that they could not process Disney film under this circumstance!! This entry was posted in 1941: The Disney Strike, Disney, Labor, mafia, politics and tagged Handbill, Illustration, Strike, Technicolor, Walt Disney, WIllie Bioff. Bookmark the permalink.